Visite la antigua ciudad maya de Chichén Itzá en una excursión de un día completo desde Cancún a un lugar destacado como Patrimonio de la Humanidad por la UNESCO. Deténgase en un restaurante local para disfrutar de un almuerzo buffet y un espectáculo de danza tradicional, realice una visita guiada por las imponentes pirámides y canchas de pelota de Chichen Itza, disfrute del tiempo para explorar el sitio por su cuenta y luego refrésquese en un cenote subterráneo. Este tour de 12 horas incluye entradas, almuerzo y transporte de ida y vuelta al hotel desde Cancún. Ver un espectáculo de danza jarana. Comience el día con su recogida de 7:30 a.m. en su hotel en Cancún o en la Riviera Maya, luego viaje al sitio de Chichen Itza, declarado Patrimonio de la Humanidad por la UNESCO, en un autocar con aire acondicionado. Pasará por la ciudad colonial de Valladolid en el camino, luego se detendrá en un restaurante para disfrutar de un almuerzo buffet tradicional y un espectáculo de danza jarana. La danza y la música son típicas de la península de Yucatán, y los bailarines se presentan con elaborados trajes bordados. Al llegar a Chichén Itzá, realice una visita guiada de 90 minutos por el sitio antiguo con un guía certificado por el INAH. Después del recorrido, tendrá una hora de tiempo independiente para explorar por su cuenta, tomar fotografías o simplemente disfrutar de la atmósfera única del sitio arqueológico. Embárquese en el autobús para el viaje de regreso a Cancún y haga una parada en un cenote, una de las muchas cavernas de piedra caliza de Yucatán. Traiga un traje de baño para nadar en el agua dulce que fluye a través del cenote; Tendrá 45 minutos para nadar o explorar antes de secarse y regresar a Cancún. Este recorrido de 12 horas concluye con la entrega en su punto de partida original. Its an all day trip try and have a good breakfast before you leave, if you are into history this is the tour for you. I would highly recommend this tour. We were picked up from our hotel early in the morning and traveled to a small town where we were able to do some shopping. We then had a buffet lunch and then it was off to Chicken Itza. Our tour guide was Abner and he was awesome. He was funny, spoke great english, and knew a lot about the history of the areas we were traveling in. Abner took us on a guided tour at Chicken Itza and then we were able to walk around and explore. The last stop was the Cenote. It was a lot of fun. The water felt great and I wish we could have stayed longer. The tour lasted a total of 14 hours, way longer than expected. We spent about 9.5 hours sitting on the bus, and a few of those hours we were just waiting on stupid things. We were the first to be picked up and it took about 80 minutes to finish picking up everyone else. The tour guide starts with getting after people for sleeping for the first few hours of the ride, really annoying especially when you have to take medicine to not get motion sickness. 2/3 of the bus only spoke English so he would switch back and forth while giving instructions and talking about the history. After a hour into the tour he gets really lazy about explaining anything in English, you could here him go on for 3-4 minutes in Spanish and then would give two sentences in English. Often it was just parts of information and he would switch back to Spanish before finishing most instructions. We stopped at four different places, the first was a Mayan shopping center and from what we noticed is the tour guide must make a spiff from the silver you buy. The second place is the cenotes, this was very cool and the food was great, After getting on the bus at the time they told us they would be leaving and not waiting for anyone, we sat for almost 25 minutes waiting for two people. Everyone on the bus continued to wait on mostly these two people at every stop for between 20-45 minutes, The tour guide claimed he would not wait but for some reason wouldn't even say anything to these two every time they were late. The chechen itza stop was also very cool, but very hot bring sun screen! The last stop is a complete waist of time, the tour guide took up to a city for a 20 minute stop so we could all see the downtown area. After twenty minutes of walking around and getting different snacks we continued to wait 45 minutes for the tour guide and these two same girls to get back. The driver and other helpers on the bus were very friendly and did great. We finally got back to the hotel at about 9 pm, giving us a total of 3.5 hours of doing what we signed up for and about 10 hours of sitting on a bus and waiting on people. It was an awesome tour, but it gets really, really hot so bring a hat or an umbrella. Our tour guide Gabriel was very informative. He was great! Can't recommend this enough if you want to see Chichen Itza believe me, you do! Quick pickup from our hotel, very informative, courteous, and flawlessly bilingual tour-guides. 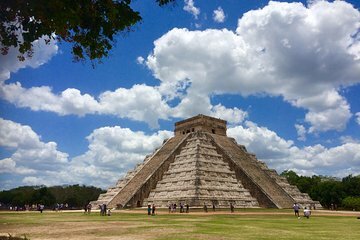 This tour is an awesome value- you are served a buffet lunch, get a guided tour of Chichen Itza, stop and shop in a cute small Mexican town, and get to shop and talk to actual Mayan descendants. Guides were super nice. Aboslutely no complaints here, probably the highlight of my trip!